I don’t travel to London often, so with this trip; I made it my mission to eat as much as I can in the couple of days I had there! 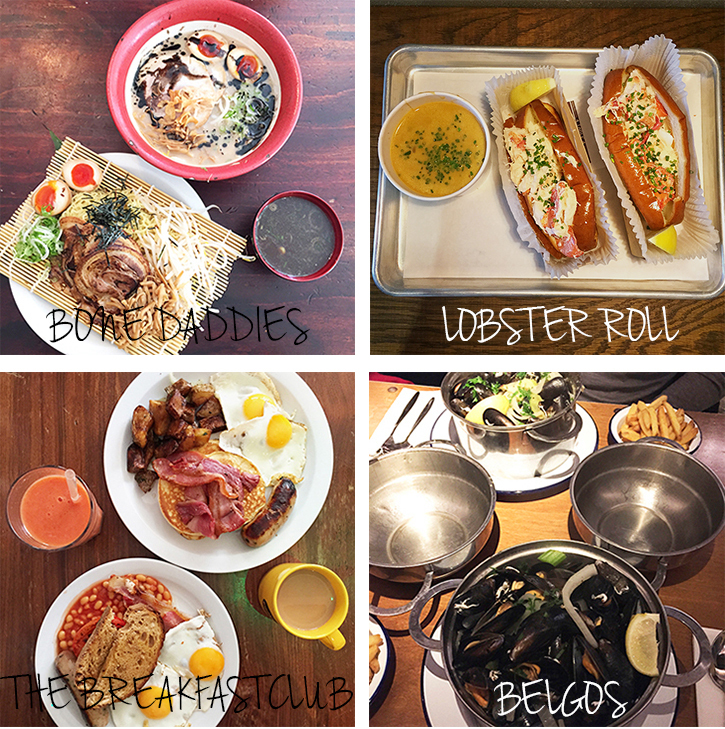 I had a long list of places that I wanted to try out, so I have decided to dedicate this blog post to all the food lovers out there! A different approach to eating ramen with the Dipping Ramen; where the broth and the noodles (cold) are separate and (as the name of the dish) you dip the noodles in to the soup and enjoy! There was a lot of hype over this place so I wanted to give it a try and see how great the food really was. There were quite a few options to choose from, but because it was our first time, we decided to try the Classic Rolls; I think what makes it great is the brioche bun, lighted toasted and warm; I would never of thought the combination would be so tasty! The sweetness of the bread really compliments and goes well with the lobster and adding a spitz of lemon for freshness really finished it off! I really have to express how AMAZING those pancakes were at The Breakfast Club! I am not usually a fan of sweet things for breakfast, but this was an exception, super buttery and moist once you take a bite! We actually had to queue outside for about 30 mins to get a table, but it was worth the wait! Nice and cosy atmosphere, I would definitely go back for those pancakes!! This was my second time visiting Belgos; I was first introduced to this place last summer and from then on I couldn’t stop thinking about the mussels & chips; such simple but great combination together, because I was feeling greedy, we decided to have one to ourselves (seriously so filling and I didn’t even manage to finish it all). Their speciality are mussels and they do have quite a selection, although we did keep it simple and had the traditional ones. However, they also have other dishes on the menu if you’re not into mussels! We actually visited Shoryu before Bone Daddies and in my opinion, I prefer Bone Daddies (tried the traditional ramen in both places). I am no ramen enthusiast, but personally I think the broth in the traditional ramen was a bit too salty for me, it also had a thicker consistency compared to BD. However it was so full of flavour, but also made me really thirsty for water! Maybe it was just the broth because I enjoyed the other dish we ordered which was the Curry Ramen. As many times as I’ve have walked passed this place, there was never a chance for me to try it out. My love for anything chocolate is no secret, so having a chocolate flavoured frozen yoghurt was like having my favourite ice cream without the guilt! Win Win! Basically the most expensive strawberry chocolates I have ever bought! The reason I got these were because last time I didn’t manage to get them so I was determined to try them this time, but me being me, I actually asked for them before knowing the price!! So I had to follow through and pay £10 for 6 chocolate strawberries (CRY)! I hope you guys enjoyed this blog post! 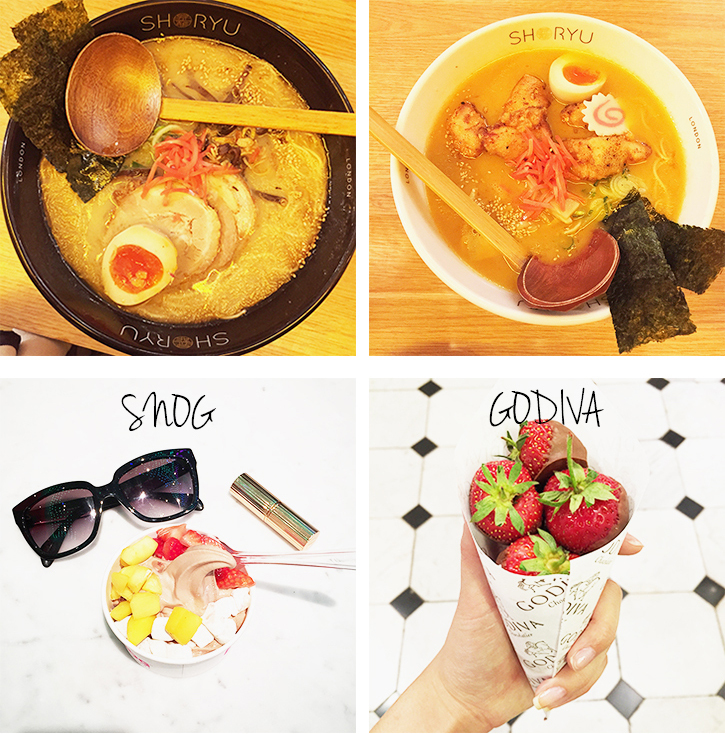 Writing this post has really made me miss the food in London! Also let me know if there are any food recommendations you would like to share with me and I will definitely go give them a try!